Mutual combat is the professional term for play fighting. If you take a photo from Chuck E. Cheese's photo ride (which is in black and white (except for the border)), scan it into your computer, open up a paint program, and turn the brightness down as low as you can, you can see colors, which makes me think that it might be possible to do a color recovery like they did with old Doctor Who episodes that originally aired in color but only survive in black and white. Prior to the twentieth century, acronyms were practically non-existent. There is only one known pre-twentieth century acronym and it was used for only a short time in 1886. The word is "colinderies" or "colinda," which was used for the Colonial and Indian Exposition held in London that year. There are approximately 900 streets named after Martin Luther King in the United States. There's one in Raleigh, North Carolina. There is actually an earlier one, Smectymnuus, which was the non-de-plume used by a group of Puritan clergyman in 1641. The name was created from the initials of those in the group: Stephen Marshall, Edmund Calamy, Thomas Young, Matthew Newcomen, and William (the W is represented by the UU to make it pronounceable) Spursowe. Seems to meet the rules of an acronym to me. Well, lads, I've done it. Something that I was wondering about today. 1. The cellphone will initially show the location of the cell tower hit, not the location of the caller. 2. Some cheaper phones don't have GPS and some phones with GPS may not have it enabled at the moment. 3. GPS only tracks on a two-dimensional basis. It does not track altitude. So, for instance, if you called an emergency number on the tenth floor of a building, the emergency operator would need to know that. Surely it's quicker and more reliable asking than going with technology... unless you don't know where you are at which point you use GPS etc. 1961 was the last where the majority of Hollywood films were in black and white. The wonderful 'Like Strangers' by Emmylou Harris was a cover of an Everly Brothers song, which I have in my iTunes library. I knew it was a cover but had no idea who it went back to. A Hard Day's Night was shot in black and white for artistic reasons and not to save money. You see, Richard Lester wanted it to be like A Day In The Life of The Beatles and since all of the photos and videos of them at the time were in black and white, so would this. Happens to me sometimes, when a song I like turns out to be a cover of another artist that I also like. 1. For the non-US 1966 concerts (as well as 4 US ones) The Beatles ended with I'm Down , for the US concerts (minus the 4 previously stated) they ended with Long Tall Sally . Besides that they stuck to a setlist and didn't stray from it. 2. Although he doesn't play it, Paul's Rickenbacker bass is visible near Ringo's drum set during the 1966 Circus Krone concert. 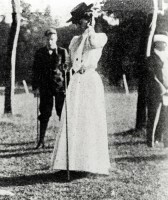 Margaret Abbott was the first American woman to win an Olympic event when she won the women's golf tournament at the 1900 Paris Olympics. Played over nine holes, one of those she beat was her mother. It was before medals, and she was awarded a porcelain bowl for winning. However, and this is where it takes an unexpected turn, when she died in 1955, at the age of 76, she was totally unaware she was an Olympic champion; let alone that she was the first American female Olympic champion! The Paris Games were so badly organised that she didn't know that the golf tournament was a part of the Games. It wasn't until after her death that historians established that the golf tournament was on the official program of events. It seems rather sad that she died unaware of her achievement, and her place in the history books as the first in a long line of female American Olympic champions. The word "elemental". For some reason I thought it sounded pretty cool when my Algebra teacher said it. But now it sounds kind of.... ELEMENTAL. "elemental features from which all other structures are compounded"
a supernatural entity or force thought to be physically manifested by occult means. That each sentence must have a minimum of one subject and one verb in it, making 'I am.' the shortest proper sentence. Amazing, first day back at school, I learn something. I guess school is useful after all! In extreme pressure, you can turn peanut butter into diamonds!